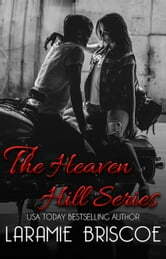 From Laramie Briscoe, the entire original Heaven Hill Series in one volume! The story that started it all featuring Liam & Denise. The love story of fan favorites Tyler & Meredith. The unexpected love story of Jagger & B. The emotional love story of Layne & Jess. The secretive love of Steele & Christine. The second chance romance of Rooster & Roni. A novella featuring Jagger & B. The continuation of Meredith & Tyler. A novella featuring Liam & Denise. The coming-of-age love of Drew & Charity. Novellas featuring all nine couples! Find out why so many readers have fallen in love with the series! If you’re looking for a good read, then this is absolutely a series you need to read! I loved every single booked within this series. Ms. Briscoe, you’ve outdone yourself yet again!